I’ve got a book in the works, so I’ve been looking forward to Midge Raymond’s EVERYDAY BOOK MARKETING. Sometimes anticipating a book can lead to disappointment, but that wasn’t the case here. Raymond covers groundwork, promotion, book tours, book launches, book groups, social media, and much more. And while I’ve thought about many of these things, EVERYDAY BOOK MARKETING catches the details that are important (mailing lists, length of readings, not over-promoting, giveaways) and stresses effective ways to get the work out important without bogging the reader down in particular tools. The first half of the book consists of Raymond’s suggestions things to do far in advance, at the book launch and afterwards. Each chapter includes some 15 minute and 30 minute and everyday specifics that you can apply (teaming up with other authors, guest blogging, postcards and bookmarks, deploying ARCs). That’s followed by a second half of interviews and advice from authors, event planners, publicists and library managers. I’ve talked to authors about marketing and even had a student do a senior project on book marketing, but I still learned news things in every chapter. My marketing to do list is growing with new ideas! What was best though was the spirit of the book: that marketing should and can be enjoyable task. 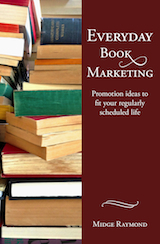 EVERYDAY BOOK MARKETING treats marketing as an opportunity to promote not just physical books as things to be sold but books as extensions of writing and it reminds us and coaches us in how to enjoy our interactions with readers. Every writer should take a good look at EVERYDAY BOOK MARKETING. 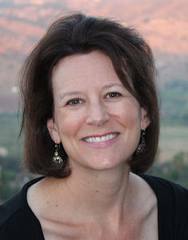 You can read an interview with Midge Raymond here, and on Oct. 9, she’ll be presenting at the Ashland Public Library, from 7-9 pm.